Regular watering of container plantings is very important. They may require daily watering if temperatures are high. Fertilize with a liquid fertilizer weekly, top with a layer of mulch and deadhead as necessary. Using a good planting mix with fertilizer and water retention qualities will help keep your containers looking fresh and full all summer. 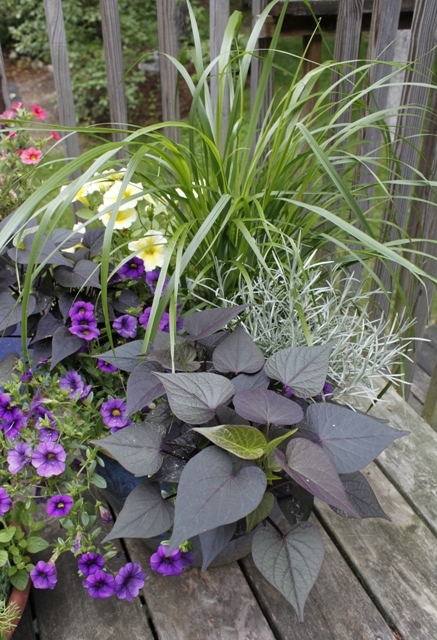 In this container I used a grass for height, petunias for fillers and a potato vine for a spiller. Plants with silver foliage or white flowers will blend well in any color scheme.